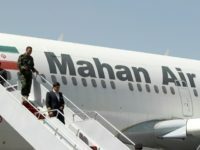 Iran’s second largest airline Mahan Air began offering direct flights to Venezuela on Monday. Mahan Air is under U.S. sanctions for ties to the Islamic Revolutionary Guards (IRGC), designated a foreign terrorist organization this week. 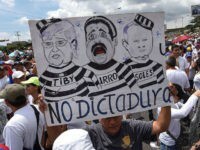 Russian officials are growing concerned Venezuelan dictator Nicolás Maduro will not be able to keep power as the international community recognizes the legitimacy of President Juan Guaidó, the Moscow Times reported Wednesday. 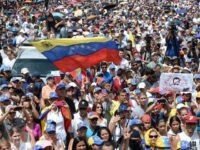 President Donald Trump said during a Sunday morning interview with Margaret Brennan on CBS News’ Face the Nation that sending U.S. troops to Venezuela remains an “option.” He also revealed he has refused a request for a meeting from dictator Nicolas Maduro, who is no longer recognized as the legitimate president of Venezuela by the United States and many other nations. 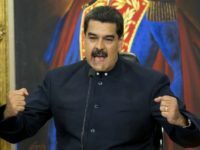 Venezuelan dictator Nicolás Maduro warned on Monday that U.S. and allied troops “will not make it out alive” if they invade the country. 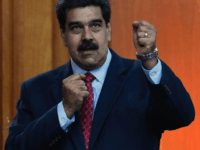 Venezuelan dictator Nicolás Maduro appeared to be the subject of an assassination attempt while he delivered a military speech in the capital of Caracas. 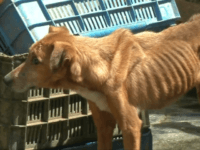 The newspaper El Nacional highlights a growing stray dog problem plaguing the streets of Venezuela’s cities this week, triggered by impoverished residents unable to afford dog food and vaccines releasing their animals into the wild. 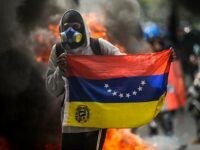 The Venezuelan capital of Caracas is drowning in garbage after socialist officials dissolved the city government. There are reportedly no plans to restart basic municipal functions like collecting waste. 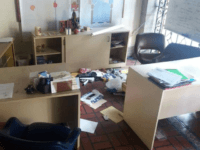 The headquarters of the Venezuelan Episcopal Conference (CEV), a Catholic organization that has loudly protested the socialist regime, was ransacked by an unidentified group in Caracas, Venezuela. 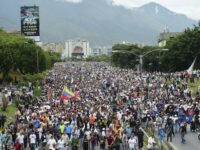 Millions of Venezuelans from around the world voted against the socialist government’s plans to rewrite the country’s constitution on Sunday, as the country’s humanitarian crisis deepens. 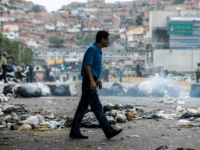 As Venezuela enters year eighteen of the Bolivarian Socialist Revolution, the international community is finally paying attention, as Venezuelans struggle to find food, medicine, and an outlet for their frustration that will not trigger rampant state violence. 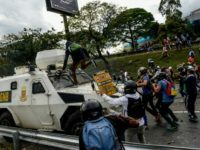 Demonstrations in Caracas, Venezuela turned violent on Wednesday, bringing a police response that included a Venezuelan National Guard armored car running into a crowd of demonstrators after a firebomb was thrown at it. 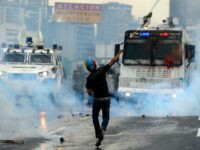 The Venezuelan opposition claims there were over 300 injuries from clashes throughout the day. One fatality has also been reported. 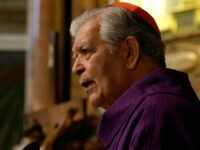 A mob of supporters of socialist dictator Nicolás Maduro stormed a Catholic Mass celebrating Holy Week on Wednesday, assaulting Archbishop of Caracas Cardinal Jorge Urosa Savino, injuring both believers attending the mass and media recording the scuffle, and reportedly looting the church. 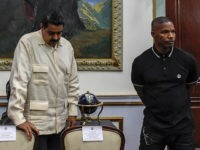 CARACAS, Venezuela (AP) — Actor Jamie Foxx has met with President Nicolas Maduro in Venezuela. 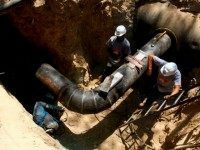 Residents of Venezuela’s capital, Caracas, had no access to drinking water this past weekend, allegedly due to a “maintenance” project aimed at keeping water levels high through the annual drought season. The capital’s woes have shed a spotlight on what is becoming a nationwide crisis fueling widespread unrest in the nation’s more remote states. 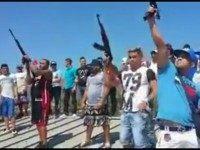 The inmate population in an island prison in Venezuela “honored” the death of the inmates’ criminal leader by shooting what appear to be dozens of firearms into the sky on the prison’s roof, raising alarming questions regarding how the government has allowed the inmates to openly amass such an arsenal. 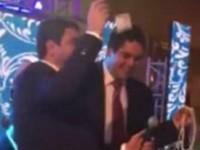 A video surfacing online of Nicolás Maduro Guerra, son of Venezuelan President Nicolás Maduro, dancing in a shower of dollar bills at the wedding of an elite business owner has outraged the nation. 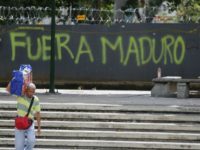 Maduro Guerra, who himself is a public official in his father’s repressive socialist government, has become a prime target of the opposition on social media over the embarrassing display. The attorney working for Caracas Mayor Antonio Ledezma has told a Venezuelan publication that his client was implicated in an alleged coup plot by a soldier who had been tortured into incriminating enemies of the state. 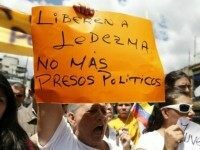 Ledezma was arrested last week in a Secret Police raid of his office.